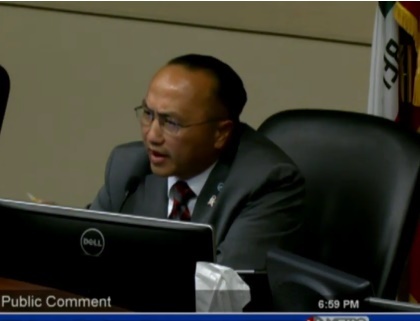 In a rage from the dais, Elk Grove Mayor Steve Ly lashed out at a constituent and denied assertions from an elected official during the Wednesday, October 11 Elk Grove City Council meeting. Ly unleashed his fury after hearing scathing criticism from Elk Grove resident Steve Lee who condemned the mayor and his companions' behavior at a September memorial vigil in West Sacramento. According to another attendee at the vigil, Sarah Kirby-Gonzalez, President of the Washington Unified School District, Ly and his entourage behaved poorly during the solemn service in honor of three murdered children. Most notable in Ly's fury was his defensive claim, which stood in direct opposition to Kirby-Gonalez's accounting of the events, that he did go to the event representing himself as the Mayor of Elk Grove. Interestingly Ly called his attendance at the vigil as "very productive." The original story on Ly and his entourages' behavior at the vigil is here, and the exchange at the city council meeting can be viewed below. Short man syndrome is an informal term and not a medical or psychological condition and goes by other names such as 'Napoleon complex'. Technically it is a form of inferiority complex in which the person attempts to overcompensate for their perceived shortcoming.